Long story short this carving is a quick freehand interpretation of a pin tail duck picture I seen. This "Trial" piece is made of solid cedar and took me roughly around 5 hours to do. All in all I am somewhat satisfied with the result. The smile on my Brides Grandfathers face.... That made the attempt a home run in my book. Looks like I may see about trying more down the line. Moral of the story.... I suppose they are right... "You never know unless you try". Also, "Never let the fear of failure stop you from trying". Sometimes life throws us curve balls. I personaly had a good one thrown to me lately and just now getting things back in line. Yesterday was the first day in well over a month I have been able to get out in the shop. I cant begin to express how great it felt to be back. The saw dust in the air, glue all over the work bench, and pile of stock turning into something... Ohhh fun times! Before my temporary hiatus I started working on a plainer cabinet for the shop. My back wasn't a huge fan of hoisting my monster 13" Delta plainer from its normal place under the cabinet to the bench. This cabinet is most definitely going to make my life a lot easier and become more efficient in the shop. I wont go into a bunch of boring details about the cabinet, but I was able to get it glued up yesterday. I did discover installing drawers are a little more complicated than I anticipated...lol. I seen folks make it look easy. I apparently wasn't holding my mouth right there for a while. After a little time and effort I was able to get them installed and working properly... Score! Going to wrap things up on here so I can get back out there. I have some drawer facings, cabinet doors, and a bunch of sanding to do today. With any luck I will have something that resembles a cabinet rolling around the shop soon. So this weekend I began designing, building, and dreaming of shop upgrades that will make shop life in my world better. I started the ball rolling with my Vortex dust collector set up. After spending a couple of hours on Google Sketch Up I was able to throw together a much better way of keeping my dust collection all in one rolling cart and keep the foot print in my shop as small as possible. 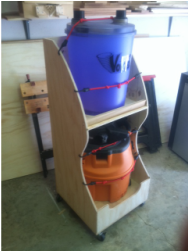 Still need to add the plumbing, assesory mounts, and the handle on the back... But I think I am rolling (get it? Rolling... Ok never mind) in the right direction. While I am finishing this new jewel up this week, and finishing up my local art compitition entry I will be putting the finishing touches on my router table/cabinet upgrade design. Hope to get fired up on it some time by the end of the week. Here is a little sneak peak of it. I am shooting for mobile, solid, organized, and use every ounce of storage possible with this cart. It will even incorperate my dovetail jig mounted on the side that will fold down when not in use. Well, its been a busy weekend, and looks like things are rolling in the right direction. Crossing my fingers I can get these projects out of the way pretty quick. Like I mentioned earlier... I have a long list of boxes stacking up on me. Take care and hope you have a great day. Well, the temps are coming down to a tolerable level once again around my neck of the woods... Which means..... More shop time! I have had an opportunity to get a few projects done in the last month (which is a major accomplishment with the over 100 degree temps every day) but productivity in my shop has slowed way down. With the sudden change in weather we have experienced looks like I will be able to get back up to speed now. Which tickles the fire out of me. 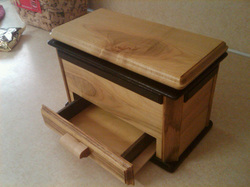 I also have a couple of projects I need to get posted up here on the site. 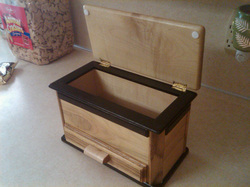 One in particular was a very special project I made for an incredibly talented woodworker, artist, and friend of mine. Need to upload that one soon. As far as projects going right now I actually have quite a few. With 5 unfinished boxes on the bench, a small cabinet needing doors, and countless small this and that's stacking up it looks like I will have my hands pretty full for a bit. At times it does seem a little overwhelming, but I think I can handle it. When ever I feel a little stacked up I can hear my adopted Dad's voice in my ear "Son, how do you eat an elephant?... One bite at a time" .... Those words have helped me countless times. Well, its been a good while since I have had the opportunity to get out in the shop to work on what I call "Fun" projects. Life gets busy sometimes I suppose. The good news is a big project I been working on for quite a while is finally done (bathroom overhaul) and vacation is out of the way. So looks like it is time to get back to doing whats in my heart.... Creative woodworking (or at least I like to think it is...lol). I just wanted to drop in and let everyone know I am still alive and kicking. I been able to dig into an old project that has been sitting on the shelf in the shop for over a year now, and have three more boxes in the design phase. One of which will be an extremely sentimental piece to me.... I will post something about that later down the line. You know, if you walked through my home looking for pieces of work I have created in the last year and a half you may be surprised to see very little. Of course there is the jewelery box I made for my bride, little trinket boxes for my daughters, and my sad little "First Attempt" box I keep for myself. Other than that a majority of my work has been built for someone else. Now I am not bringing this up as a complaint in any way. I absolutely love building things for others. I honestly get great joy knowing I am building something that will become important (or even sentimental) to another person. Yea, I am a sap like that, but it is... what it is. Now I bring this up due to me having the shoe on the other foot recently. I recieved a message from a long time friend asking for my address. My old friend Chris said he had some old magazines he thought I would like, and wanted to send them to me. He also mentioned there will be a little surprise for my Bride and myself in the box as well. As a week goes by I forget about the gift coming from my Northern friend until I see a large box sitting on my front door step. In this large box I first discover the magazines all stacked up nice and neat on the top. I drag out the bounty and begin looking through them thinking of how nice it was for Chris to send me these. Just then something in the box caught my eye. Looking into the brown paper stuffing's of the box I see wood. My first thought was "What in the world could that be?" After carefully pulling back the layers of packing, and removing it from the box I discover what the surprise my friend Chris was talking about. Not very often I find myself speechless, but I got to say I was really blown away by this incredible gift I recieved from an old friend. I gave him a call to thank him for everything, and he began to tell me how it came to be. He mentioned his shop time had been cut way down due to cold weather and he finally got down to the shop cleaning up after a long stent. "One minute I'm cleaning the shop and next thing I know I was building a box" is what he said to me. The real kicker that I found very cool was he said that while building it he knew it was for me. You know... That is what it is all about. So you may ask "What does this have to do with my shop?". Well to me it means everything. Woodwork to many is a passion. Something we put our heart, and souls into. After seeing this awesome box and talking to the creator I knew this was a testament to that fact. Thanks again Chris. This was most definitely a treasured gift that has a new home on my kitchen counter top. Cant wait to return the favor. What Is "Around The Shop"? Whats happening in the shop? What in the world was I thinking when I built that? How in the world can this crazy guy spend so much time out in a shop playing with saw dust? Well, this section is a little place to keep up to date with whats going on around the shop and maybe a little insight on what might possibly pop up in my head from time to time. In all honesty am not a huge fan of so called "Blogs". So I decided to dub this more of a "Shop Diary" of sorts. Kind of my way to log my "Journey Into Fine Woodworking". I have come to realize throught the last year or so that any form of creativity (poetry, painting, music, and yes woodwork) is a journy without a destination. Sounds crazy to think you would make a trip without a stopping point, but that is exactly the way I look at my woodwork. I have to be honest in saying I look forward to seeing where this journy takes me. So check in from time to time to see whats going on. I will try to keep you in the know. Thanks for checking out the first "Around The Shop"